Forklift Certification York, PA | Get Employees Certified in 1 Hour! York is an important center of commerce in southeastern Pennsylvania. Located next to the PA Turnpike, Interstate 81 and the famous Lincoln Highway (Route 30), York enjoys a thriving business district. The city contains many warehouses, distribution centers, and other facilities that employ forklift drivers. If your company has untrained forklift drivers, or you’re unsure about current safety and training requirements, FLC will get you up to speed ASAP. We offer York forklift certification and training for new operators, veteran drivers, and everyone in between! With forklift certification in York from FLC, your company is OSHA compliant. If you’re ever under an investigation or audit, FLC training records will show OSHA that all of your employees are trained. Without this proof, OSHA could levy severe fines. What’s more, our York forklift certification and training packages keep your facility safe, since well-trained forklift operators are less likely to be involved in accidents. Plus, our York forklift certification is ideal for individual employees. With FLC training, you’ll have better job opportunities, and your training is valid all across PA and the United States! Avoid OSHA Fines & Penalties – Register with FLC for York Forklift Certification Today! Many Pennsylvania employers often ask: can I afford the cost of training? However, they should actually look at it this way: they can’t afford the costs associated with non-compliance. OSHA fines, penalties, and audits can result in significant financial setbacks for any York company that employs forklift drivers. If your company has any training gaps and you’re looking to gain OSHA compliance, FLC has the training courses you need. Our forklift certification in York is the convenient, affordable alternative to expensive training sessions. And since our staff has plenty of experience with OSHA, all of our courses are always up to date with the latest safety guidelines! Train a Trainer – the ideal course to have a Certified Forklift Safety Consultant on-site at all times! Training Kit – this popular course covers everything you need to know about safe forklift operation. Bundle Package – can’t decide between the first two? Get both with the Bundle Package – you’ll get everything at an exclusive discounted rate! 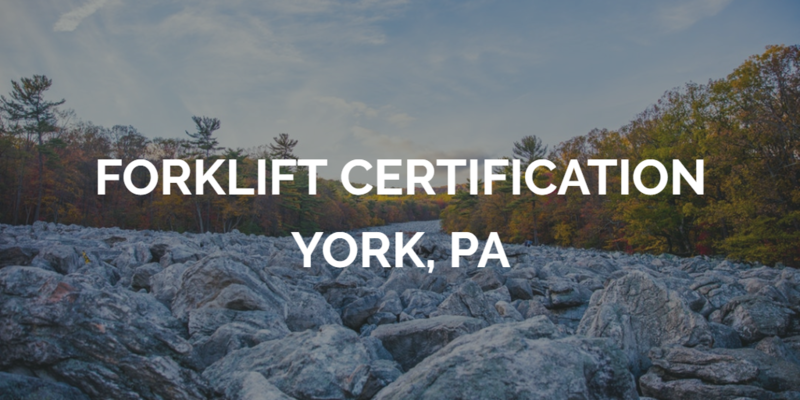 Don’t put off your forklift certification in York any longer. Your company benefits and your employees will also enjoy a safer, more productive work environment. If you have any questions about our York forklift certification program, pleases call FLC’s York forklift training experts at (888) 278-8896. Thanks for considering FLC for your complete York forklift certification requirements.